The magnificent Fullerton Building is a grand neoclassical landmark built in 1928. Gazetted in December 2015 as a National Monument, it was once home to Singapore’s General Post Office, the Exchange Room and Exchange Reference Library, and the prestigious Singapore Club. For a nearly a century, it has played a pivotal role in Singapore’s rich history. 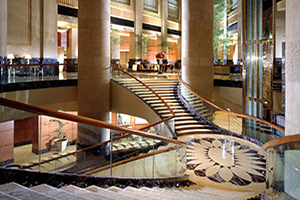 Today, the Fullerton Hotel Singapore has been transformed into a stunning 400-room heritage hotel. 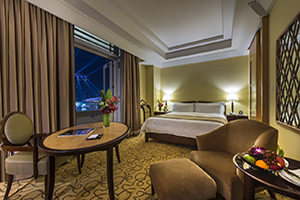 Views from the 400 rooms and suites are unrivaled in Singapore. Transformed from a 1928 historical landmark that was home to the General Post Office, it has been honored as Singapore’s 71st National Monument. 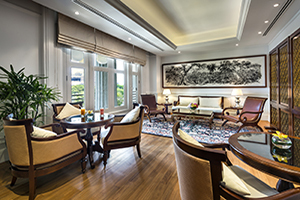 The hotel successfully blends rich heritage with contemporary style. 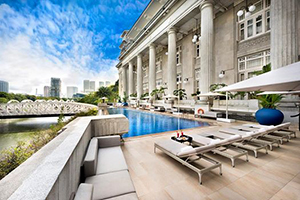 Prime location in the heart of the financial, arts and civic districts, overlooking the Singapore River. Indulge in the Afternoon Heritage Tea set, at The Clifford Pier, once the landing point of Singapore’s fore fathers, and now transformed into a chic waterfront restaurant serving local heritage delights. The Fullerton Spa and 82 feet outdoor infinity pool. I wanted to let you know how much I liked the Fullerton. It is a real gem, beautifully restored and in the best part of town. The staff was so accommodation and we got a beautiful upgraded room. 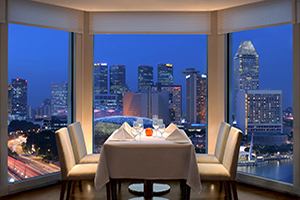 When I book someone to Singapore, the Fullerton will without a doubt it will be my choice. 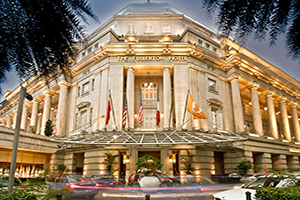 Our 3 week journey in the Far East ended in Singapore with a stay at The Fullerton Hotel which exceeded our every expectation. 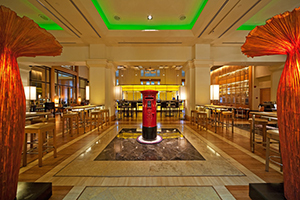 The stunning converted post office building combines Singapore’s rich heritage with a distinctive contemporary flair. Situated directly on the river it makes the perfect location for walking around the Esplanade, the Boat Quay, museums and Merilon Park. We enjoyed excellent service during our stay and had a wonderful dining experience at the Lighthouse Restaurant. Our well appointed room overlooked the pool and river. Our stay in Singapore was a delightful change to the other 5-star international “chain-hotels” we are so familiar with. Singapore Changi Airport – 25 minutes from the Hotel. Marina Bay Cruise Centre – 15 minutes from the Hotel With the Singapore skyline as it’s backdrop, this architectural icon has the capability to accommodate some of the world’s largest ships. Spanning nearly the length of three football fields, the terminal features a spacious arrival and departure hall as well as a large ground transportation area to ensure a seamless experience for passengers.